Highly Detailed Art work as shown above on the front of the Romper. Script shows “Intake” in Bright Yellow, complimented with the very recognisable ‘FORD’ logo in the large image across the tummy region of the Romper. Surrounded by multi- coloured stars around the Bowtie image. The rear of the Romper is the business end, with the Three Dimensional script proudly boasting the “exhaust” with smaller “smoke like clouds” coming from the nether region! Three x Metal buttons at the bottom of the Romper, enabling quick “on/off” fitment to your special little pride and joy! 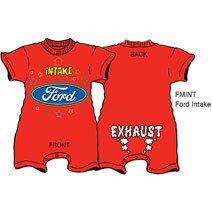 Baby Romper Colour: Available in Red only, with genuine FORD Official Licensed Product decal Tag.